This entry was posted on Saturday, June 19th, 2010 at 6:26 am and is filed under private gardens. You can follow any responses to this entry through the RSS 2.0 feed. You can leave a response, or trackback from your own site. Oh, I wish I’d known! It may have just been at the time of the smoke bush transplant that I finally took out a smoke bush that was getting much too large for its location — three years in a row. I now have Arctostaphylos pajaroensis there, but wouldn’t it have been great if I could have passed on the smoke bush? Aside from that, I’m getting ready to do a post about the myth that weeds don’t grow because other plants have taken their place. I have literally hundreds of liquidambar seedlings under the protective arms of the coyote brush, and the spurge grew and went to seed hidden by the poppies, so I know I’ll be pulling again next spring. Most areas look good only because someone works at it. The smokebushes have been blooming at the nursery for a few weeks now. I can see why people love them and would work hard to take them when they move. I like that one planting that you show with the missing plants, though still having the taller shrubs that you installed in the first place would probably make it a nicer space. You can plan for how plants morph throughout the year, becoming the center of the attention or receding into the background as the seasons change, but when it’s gone altogether, that can be a different story. Funny with the coyote bush–I had a chance to visit my parent’s old house where I’d helped plan and install the landscaping. Tenants had ignored the yard and many of the plants had died. But the coyote bushes were moving in. This smokebush had only been in the ground two years and it was dormant at the time. I know what you mean calling it a myth, though some plants seem to do pretty well; I don’t think the tenants are doing much weeding in the planting with nepeta and snow in summer. 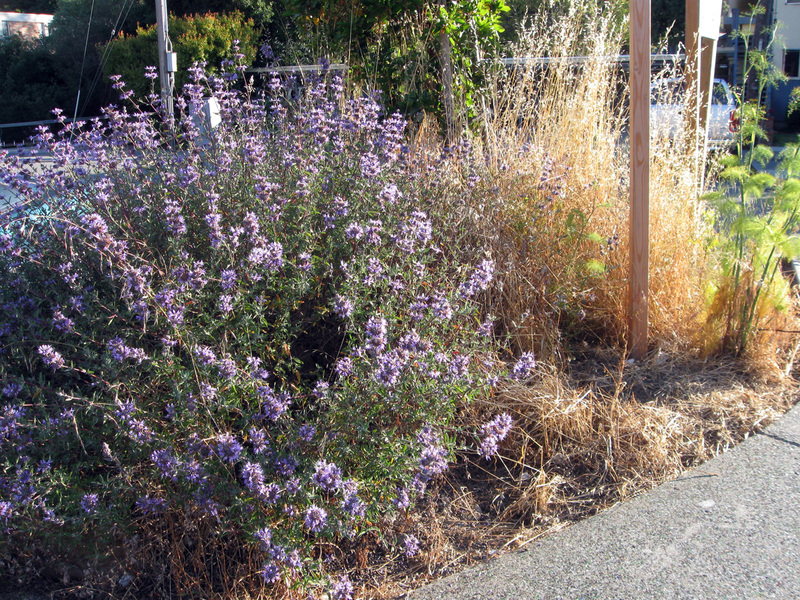 Ceanothus does all right, but that area in the planting always had a ton of grass seeds blowing in. Coyote brush acts as a pioneer and nurse species, so maybe it’s not so good at suppressing weeds. 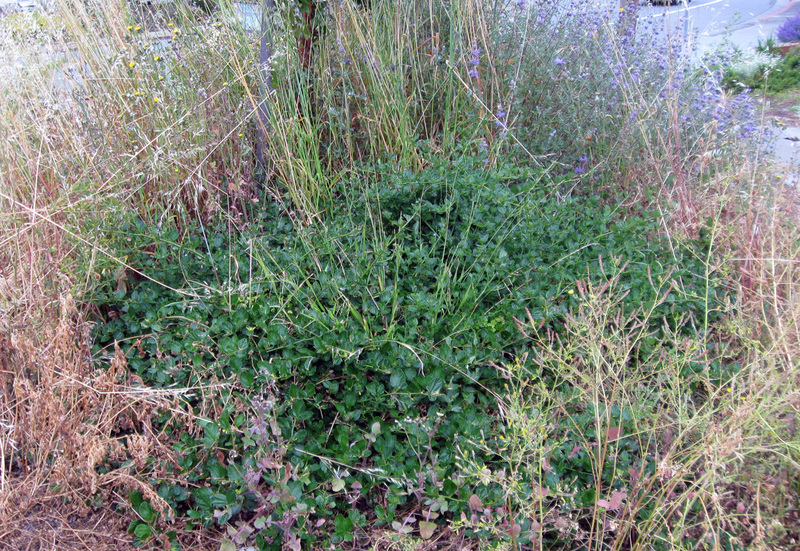 Mulch is another thing that is supposed to suppress weeds, but only helps suppress the weeds. It generally just makes the weeds easier to pull, I think. 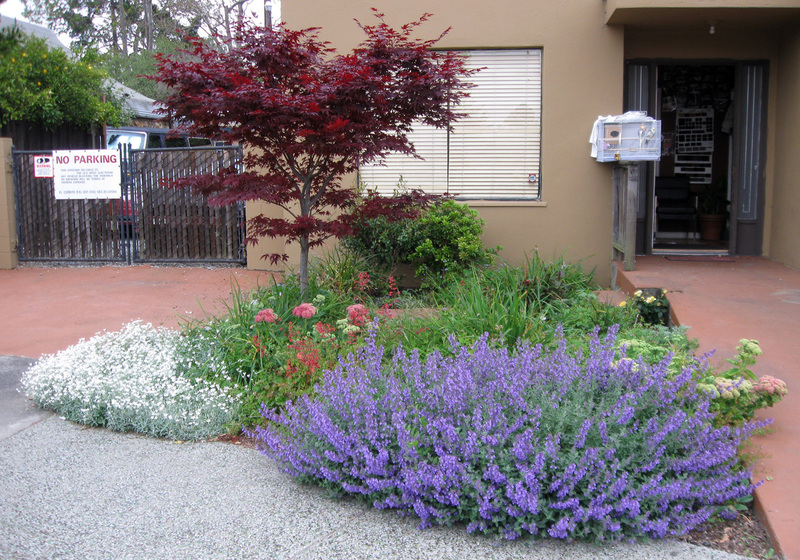 I was thinking, looking at my photo, that I can see why people love to plant Mexican feather grass with smokebush. If only that grass didn’t reseed everywhere, I would plant it too. There are worse things than having coyote bush move in on one of you plantings. Hi there! 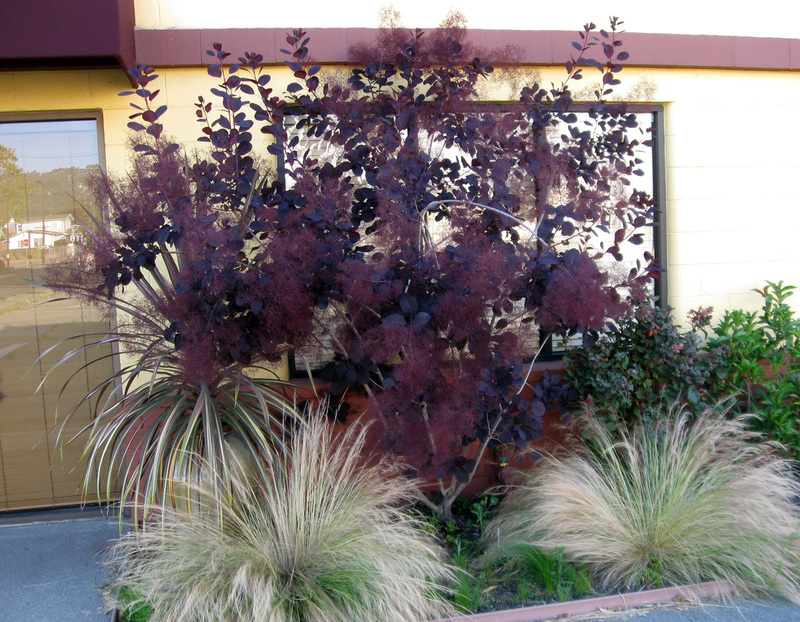 It’s stunning, the smoke bush and Stipa feather grass combination! Very good design indeed. We can take credit for the smokebush against the yellow wall, but not for the addition of the mexican feather grass. 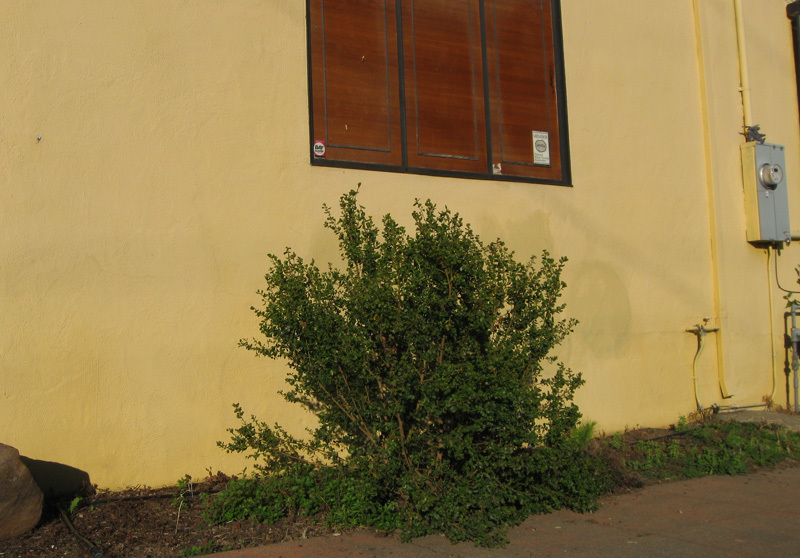 That was added by the client after he moved the smokebush to the new site. Mexican feather grass is one of those plants which I don’t let myself plant, but I always find beautiful when I see it planted by other people. The purple and gold is lovely.